Tonight is the first night of Hanukkah, the Festival of Lights. My all time favorite Hanukkah book is Moishe's Miracle, still in print in paperback. Poignantly written by Laura Krauss Melmid, and splendidly illustrated by David Slonim, this is the miraculous story of a poor couple struggling to make ends meet during the time of Hanukkah. Milkman Moishe owns only two cows ("Moo-ishe, Moo-oishe" they moo) but he gives away his milk and cream to the poor people of Wishniak. What a wonderful, expressive illustration on the cover! 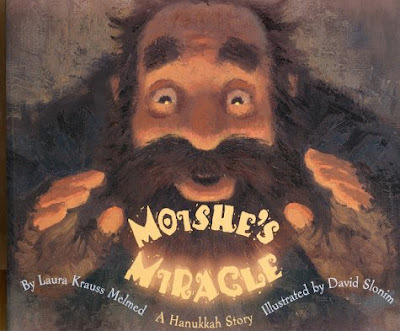 MOISHE'S MIRACLE is one of my favorite Hanukkah stories. 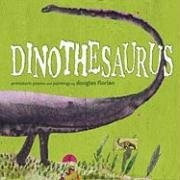 I used to read it aloud in the library in the elementray school where I worked. I also love HERSHEL AND THE HANUKKAH GOBLINS. Other favorites by Eric Kimmel: ZIGAZAK: A MAGICAL HANUKKAH NIGHT, THE CHANUKKAH GUEST, and THE MAGIC DREIDELS. In November, I heard Kimmel speak at a children's literature festival in New Hampshire. He is a wonderful presenter--so full of funny childhood stories. I also met Eric Kimmel at an IRA conference and he signed some books for my own kids. Such a warm funny fellow and so prolific. 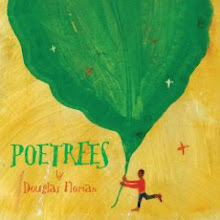 Gorgeous cover illustration! 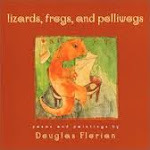 I paint, but haven't illustrated books, other than homemade ones. Well, after my brain kicked in some inTELLigence jumpstarting, I took a grand tour of the books you've written and illustrated by visiting Amazon. My kids are now teens or I'd have seen your delightful books. I'm a voracious reader, active with children, writing and especially as a professional artist, so I'll pass on this find of you! I admire your work. After seeing you pun also, I feel a kinship. (My family kids me no end with the puns they've endured since I was a child, but I think punning and nonsense words help us retain that playfulness every adult should still relish.